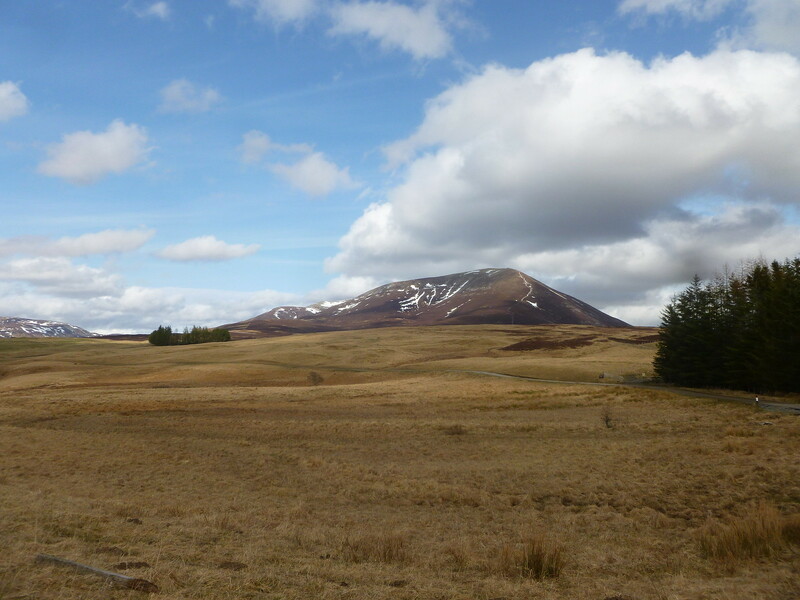 Driving up the A9, the views were absolutely stunning; it was all I could do to keep my eyes on the road and obey the speed limits. Finding my way up the single track road, I arrived at the parking space at 7.05 and imagine my surprise to have been beaten there by 2 other cars A couple left just as I arrived, but the owner of the other car was long gone. 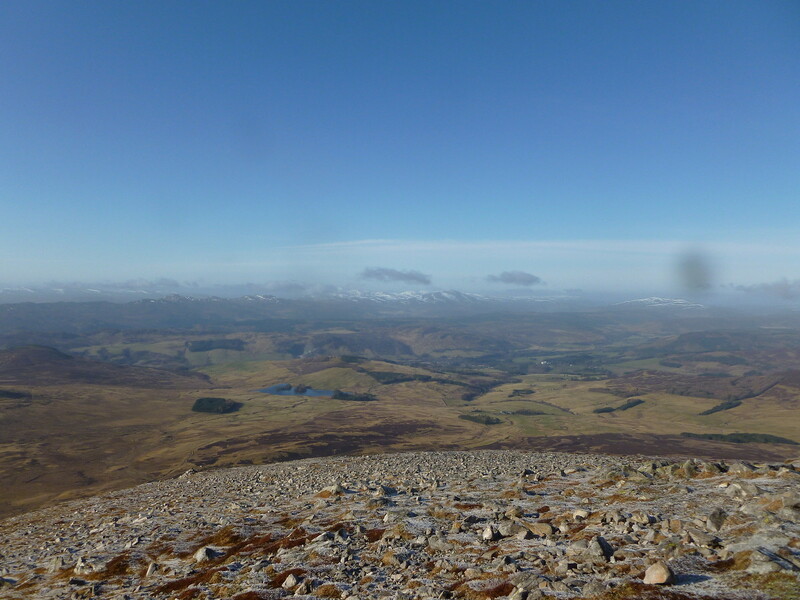 By now the cloud had cleared from the summit of Carn Liath and the sun was beating down. 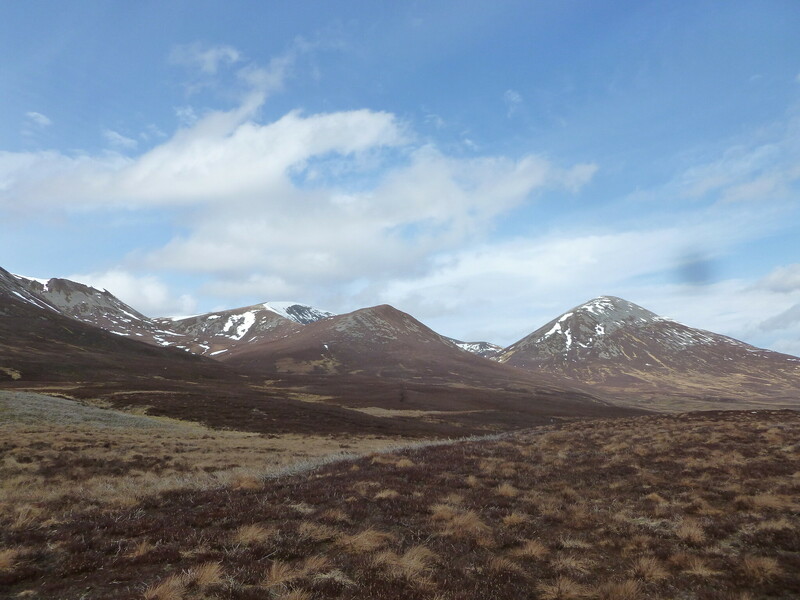 I stopped for a drink and to lose some layers before setting off across gentle boggy slopes which soon turned into the steep, stony, eroded path that scars the mountain and can be seen for miles. It was hard going, especially in the warmth and I kept telling myself to slow down and enjoy it but my legs had other ideas! 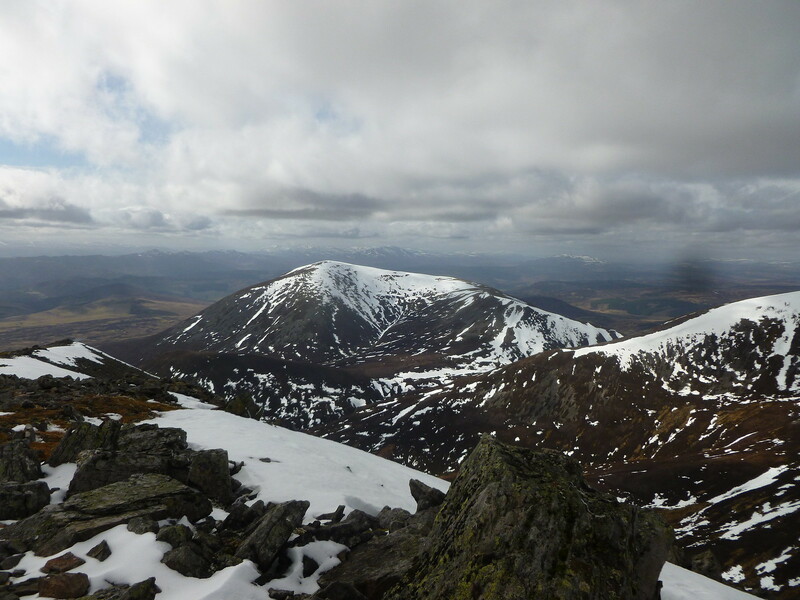 As I climbed higher, I could see some curious white flakes on the ground, reminding me that, despite the warmth and conditions, it was in fact March, although one could easily have mistaken it for June! The views back the way were breath-taking and I had to keep stopping for photos. During one of these photography sessions, I noticed someone else coming up behind me. It was going to be busy today it seemed! 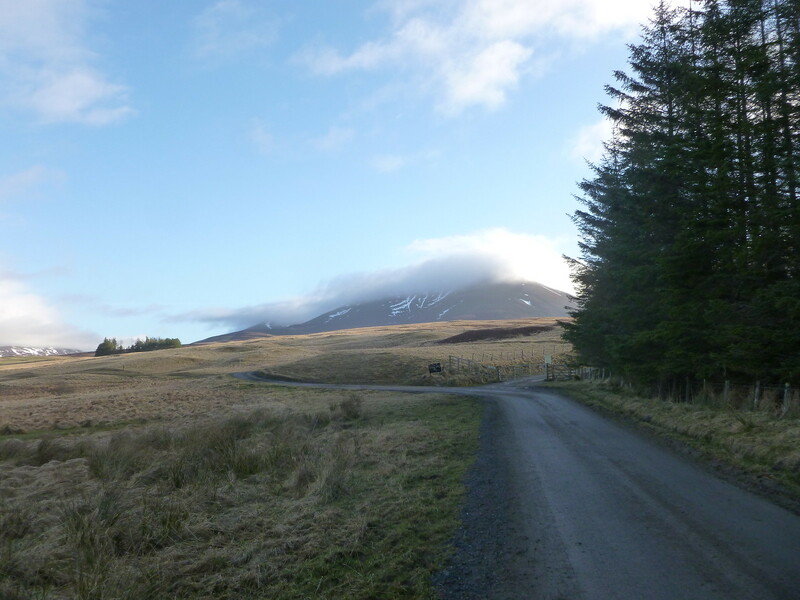 As I came over the worst of the slog onto a relatively gentle final climb to the summit, the breeze picked up which was most welcome. I had to stand and admire the beauty of my surroundings before continuing up to the summit. I don't think I could ever grow tired of days like today. I pondered on how lucky we are to be within such relatively easy reach of these wonderful views and how alive it makes me to feel to be out there. After the week the world has had, it seemed particularly poignant to stand there and enjoy every moment. 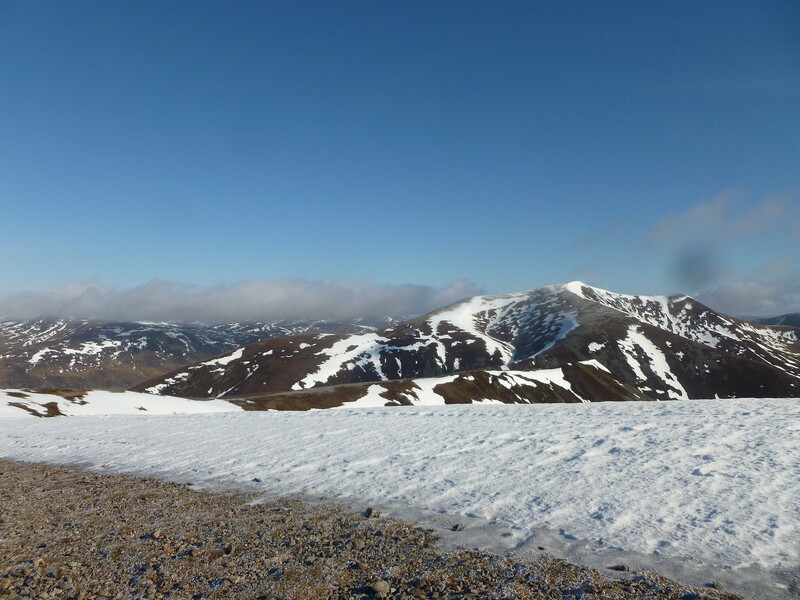 Eventually I walked the final few metres to the summit and the full vista was revealed. 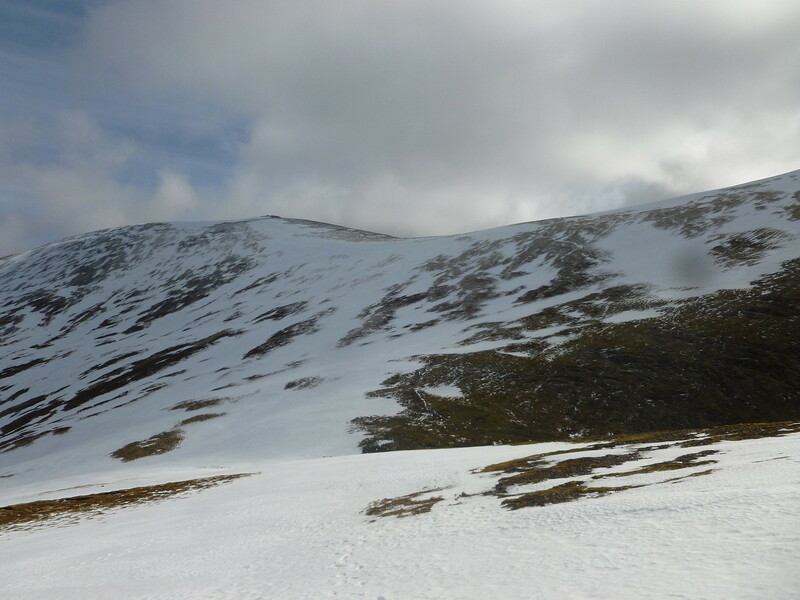 I could see the ridge ahead of me, my next 2 targets Braigh Coire Chruinn-bhalgain and Carn nan Gabhar as well as the possible route down over the ridge of Airgiod Beinn which was looking more attractive by the minute. The views in every direction were wonderful and I spent so much time taking pictures that the guy behind me caught up. The wind, although not very strong at this moment, was extremely cold and the sun decided to choose this moment to go behind one of the few clouds still in the sky, so I layered up and set off down the curved ridge. I tried to take my time as much as possible here too, as it was only 9am and I didn't want this wonderful day to be over too soon! Of course soon the sun came out again and I was far too warm, so I had to stop and take something off, at which point I was overtaken by my pursuer! 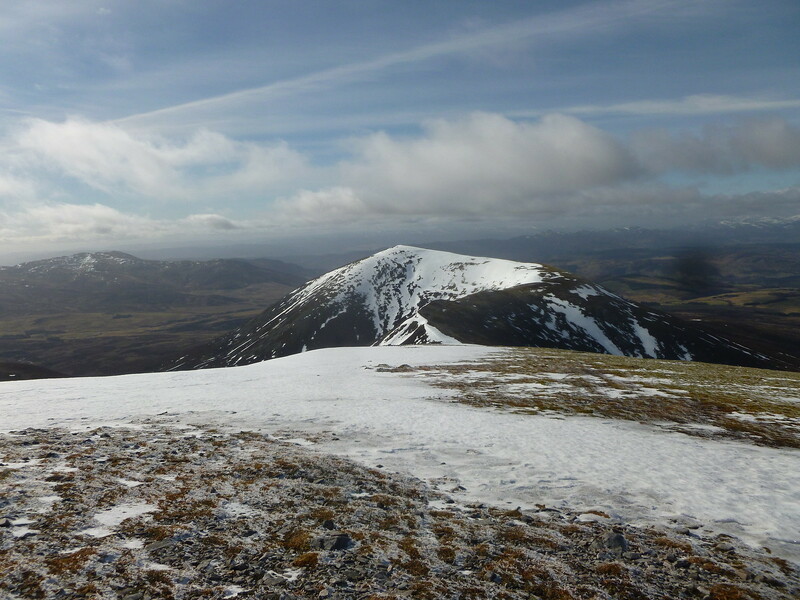 I made my way along the ridge, admiring the stunning views and the many coires of the Beinn a’ Ghlo (19 according to Cameron McNeish, I have to admit I didn’t count). 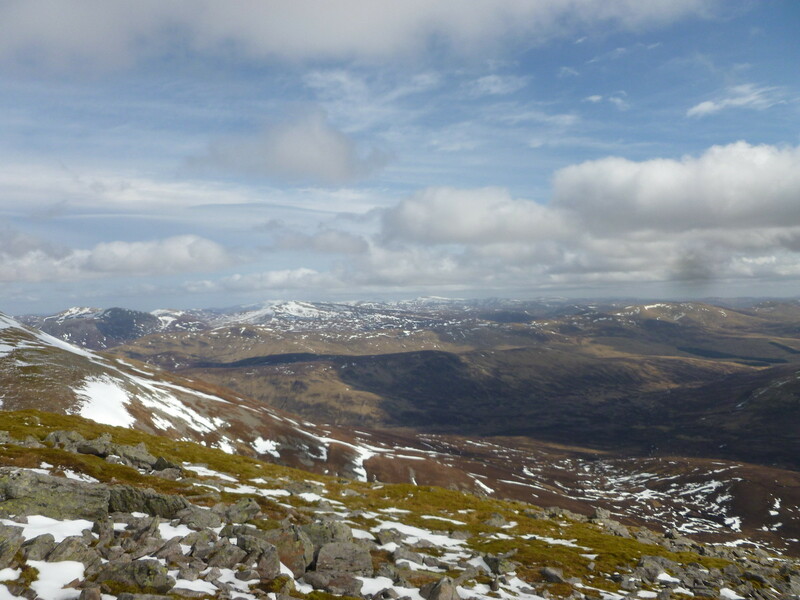 It was a steep rocky descent down to the bealach and then straight away began climbing up the other side. 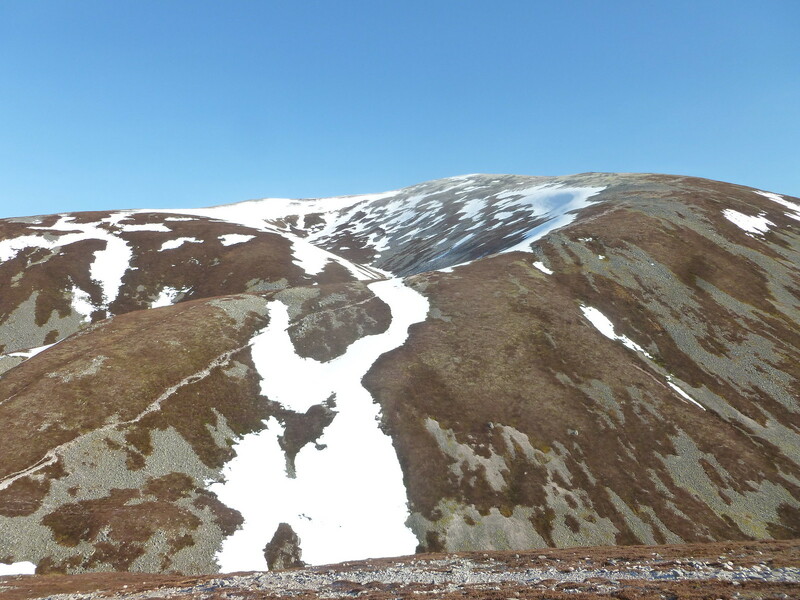 There was much more snow here – it must have been out of the sun more, although it was very warm on my back as I started up Braigh Coire Chruinn-bhalgain, which I didn’t attempt to pronounce…. Once my legs had remembered how to go uphill again, this was a long but enjoyable climb. The enjoyment was increased by the stunning views of course. There was an impressive cornice on the top of the coire which looked like it could collapse at any moment. 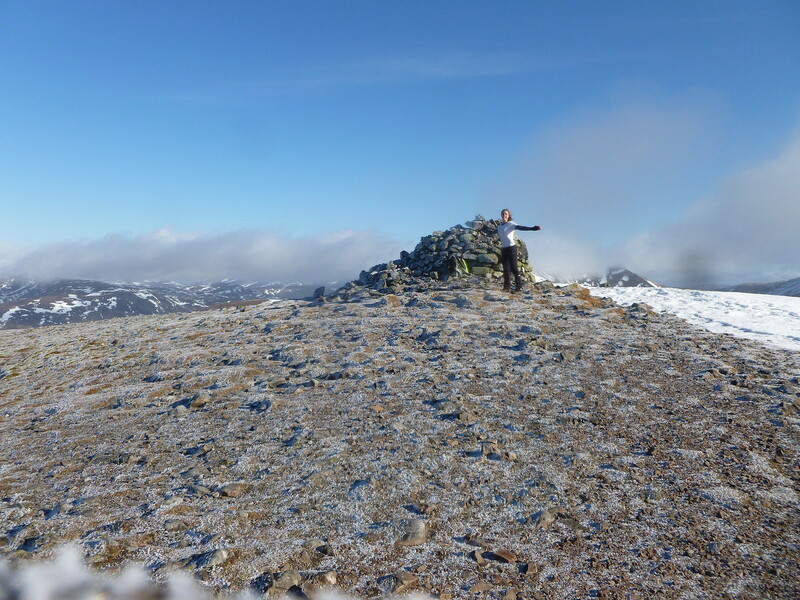 Eventually the huge bulk of the mountain was conquered and there I was at summit number 2! Again it was pretty chilly, so layers were back on before summit photos this time. The route was less obvious here, and I consulted the map and instructions before doing anything stupid. 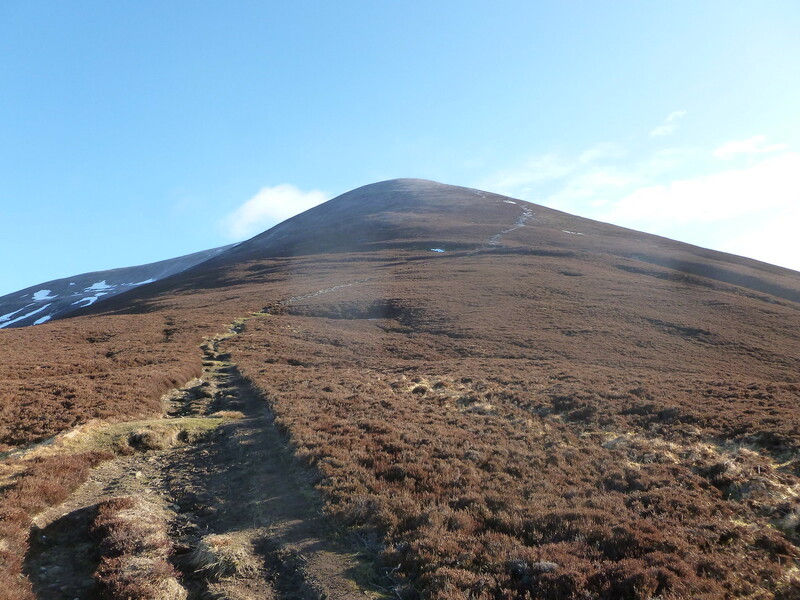 I treated myself to a mars bar as I felt I’d earned it, and then followed the ridge along to the second summit as directed, then traversed left a little before heading steeply down. 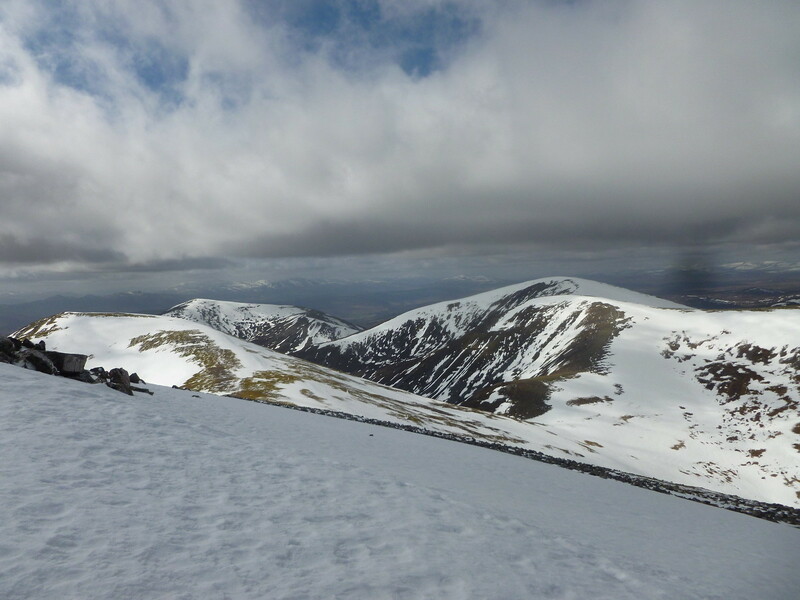 There were footprints in the snow here which was reassuring, as it felt a little bit like walking off the edge of a cliff until you were actually there…. 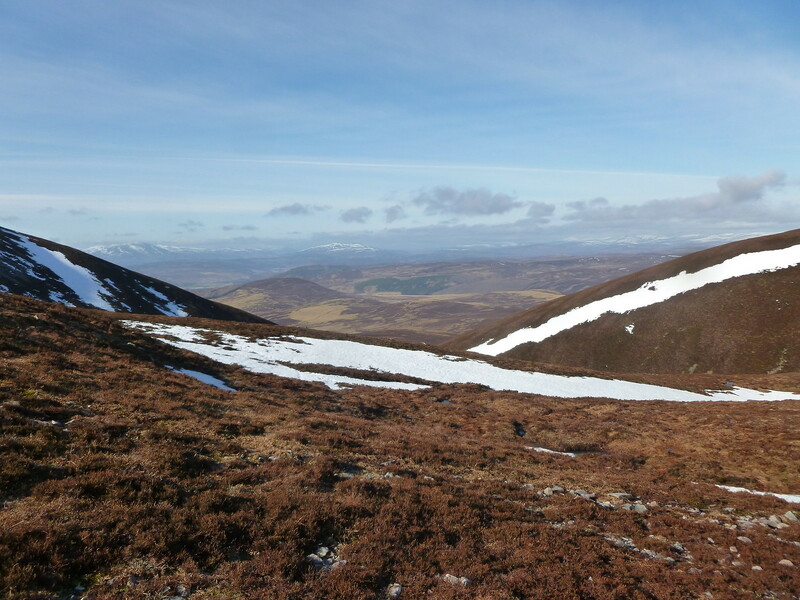 Once over the edge, there was a path which was obvious most of the way down to the bealach, snowy and slippery in places, but the drop was made with dignity intact. 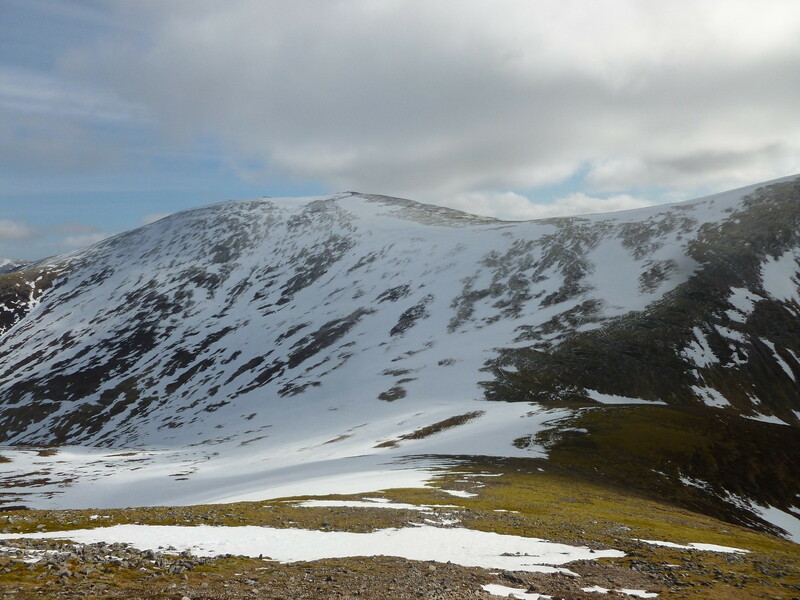 The bealach and the whole side of Carn nan Gabhar was in the shade; there was much more snow here and it was a bit chillier which was actually pleasant for this final climb. 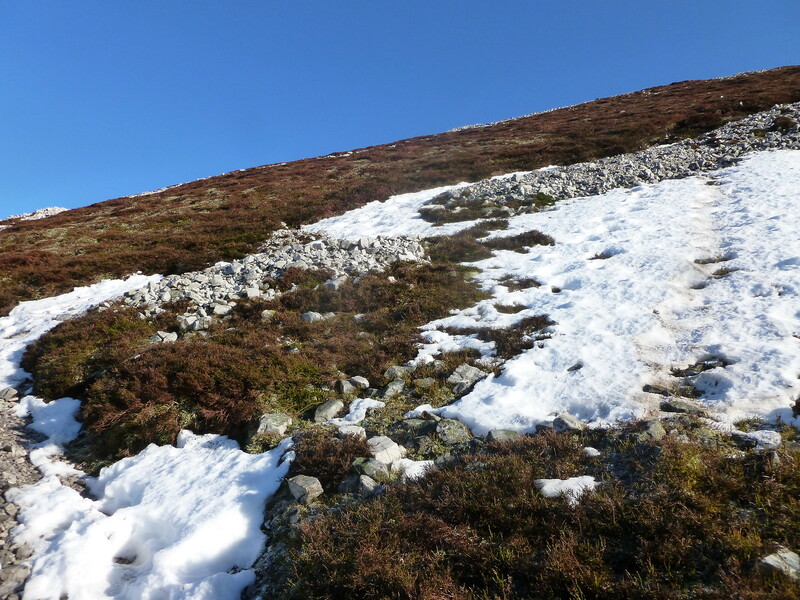 The path was visible much of the way, although not always easy to walk on as it was filled with snow. 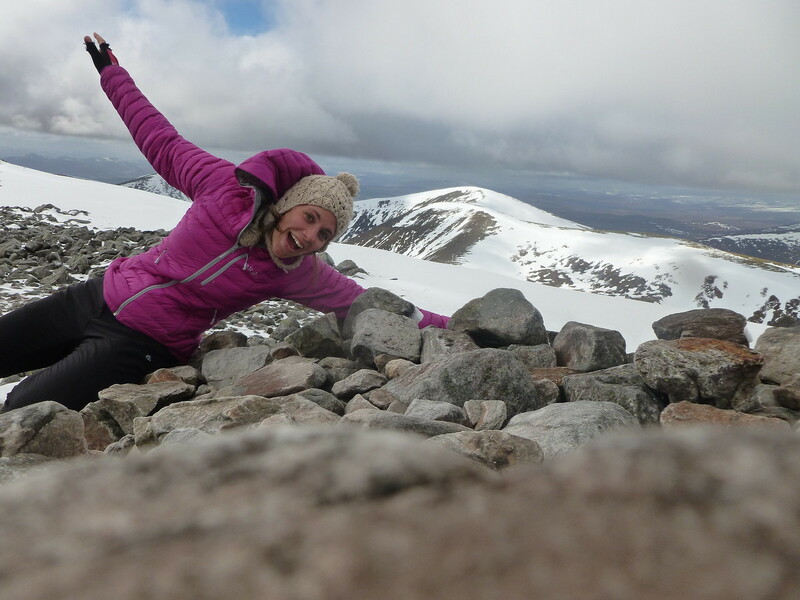 This ascent wasn’t as bad as I was expecting – perhaps my fitness isn’t so bad after-all. I bumped into a man coming down who turned out to be the early bird from the car park – he said he had started walking at 6.30 which must have been wonderful! 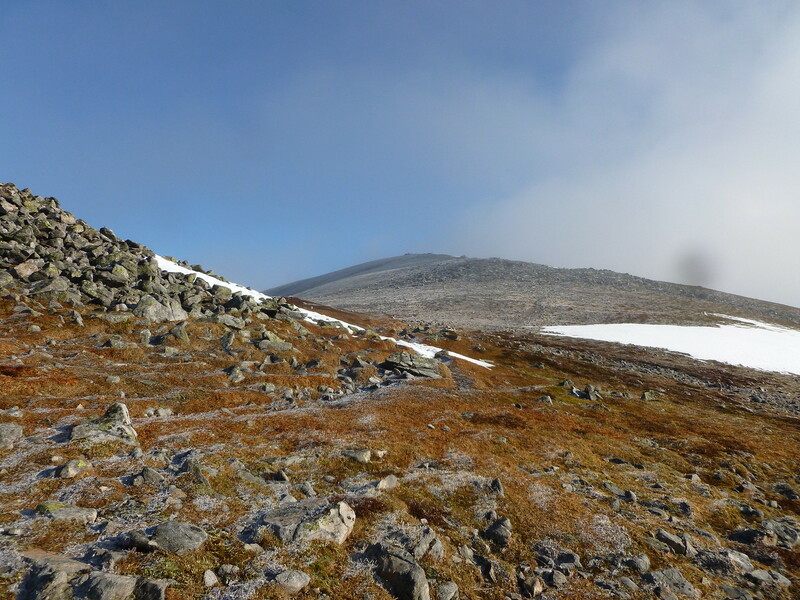 Soon after parting ways, I came to a large piece of snow to cross. 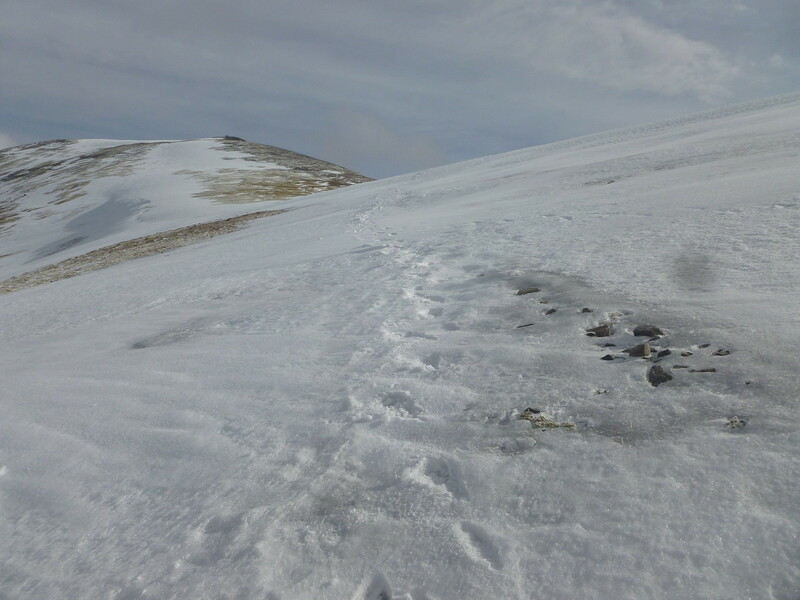 I could see steps and started to follow them before realising that it was a huge piece of ice, not snow…. A complicated manoeuvre of getting my ice axe out without slipping down the ice followed, fortunately without mishap. Should probably have got it out earlier…. There were some dodgy moments where my hobbit legs couldn’t reach the footholds so ended up crawling, but made it across in one piece, which is what matters afterall. Who needs dignity?! 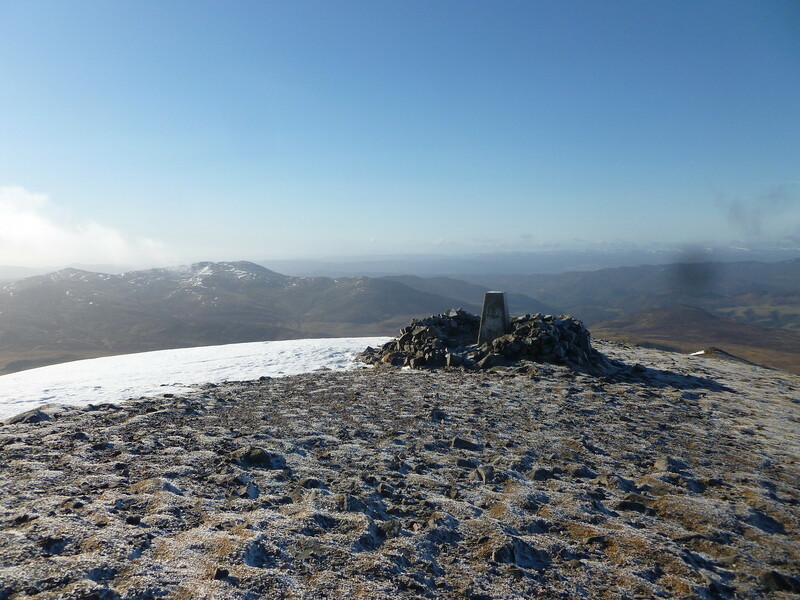 After that it was a simple walk to the first huge cairn, which then revealed a trig point and finally a summit cairn some distance on. 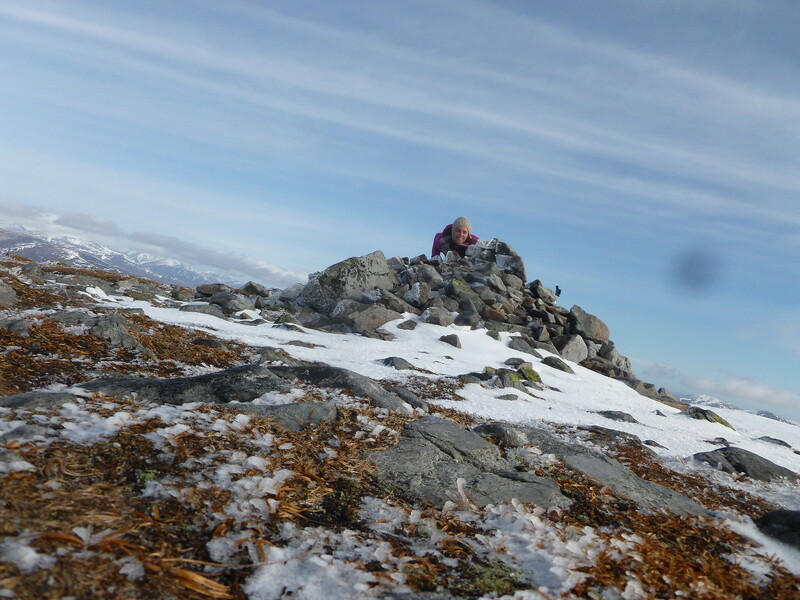 I met my quarry at the cairn and we chatted for a few minutes before he set off down and I took some more photos and found a sheltered spot to eat my sandwich. I could hardly believe it was only 11.15 but it felt like lunchtime! 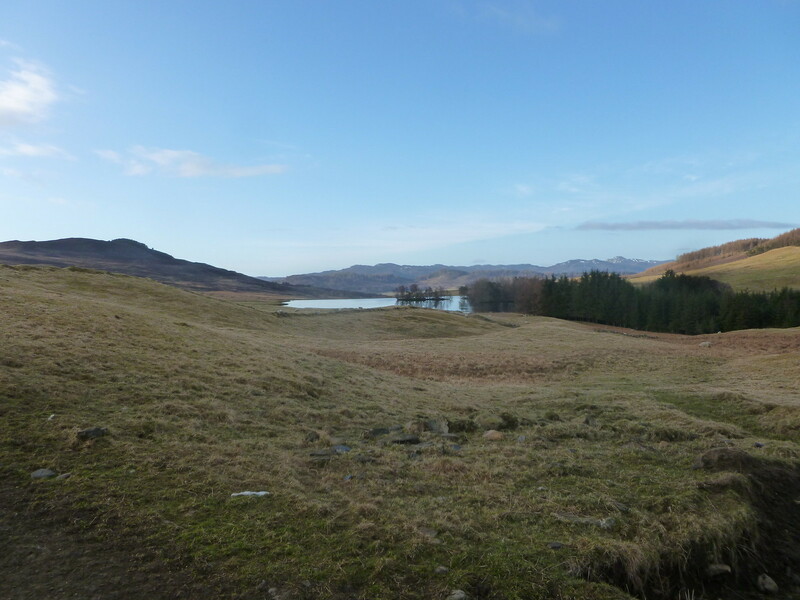 It was a brilliant spot to sit and eat – fabulous views in every direction, couldn’t ask for better really. 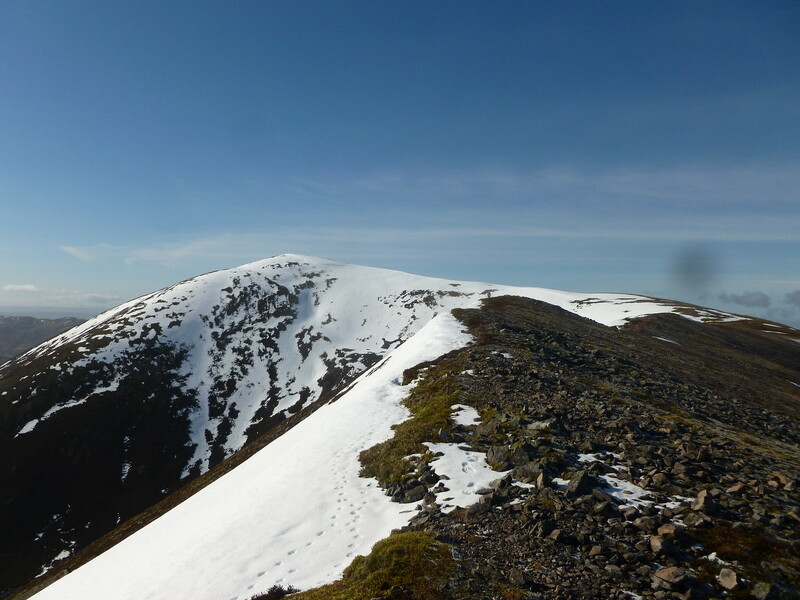 When I set off shortly after it was much windier… so walking back along the summit ridge was harder work than it should have been, as well as being pretty chilly. Rewarding myself for being awesome with a coconut macaroon, I marched on and came to decision time. 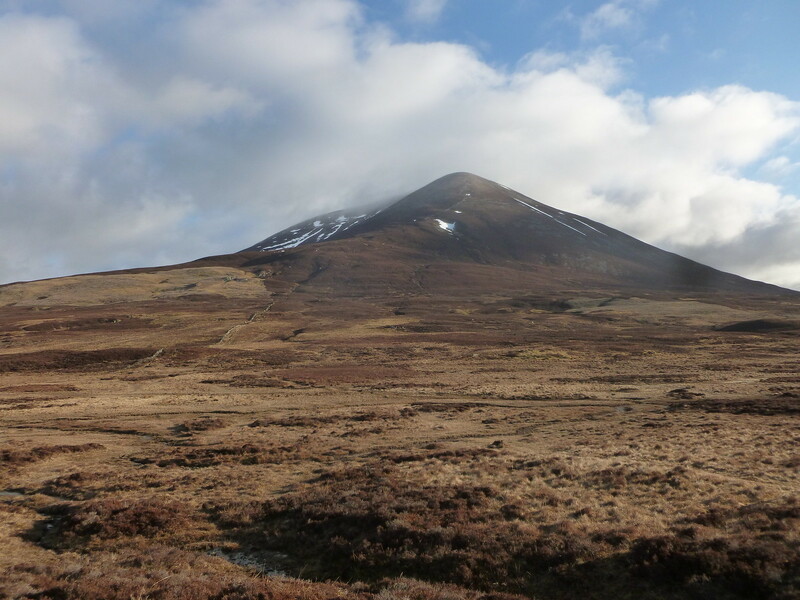 Airgiod Beinn or not? It was always going to be a “yes”. 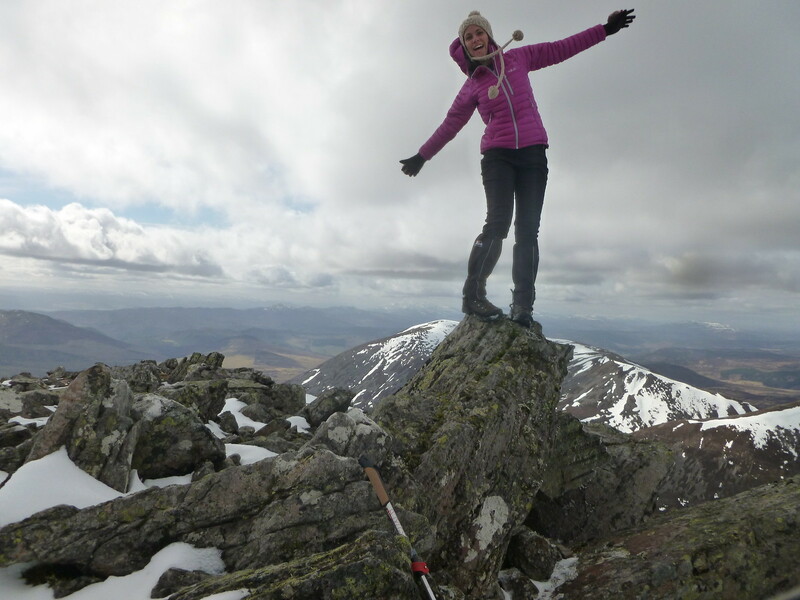 As a child walking in the Lakes I would always walk over unnecessary summits and it seems that little has changed since then including my height I was also wanting to get the views of the whole ridge that I thought I would get from there. 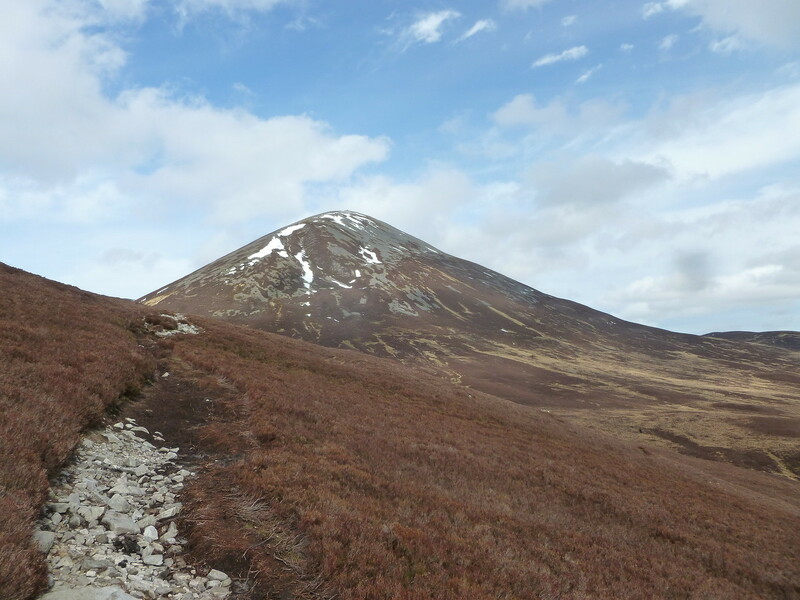 I’d spied a zig zag path down the last bit so knew that getting down would be no problem. 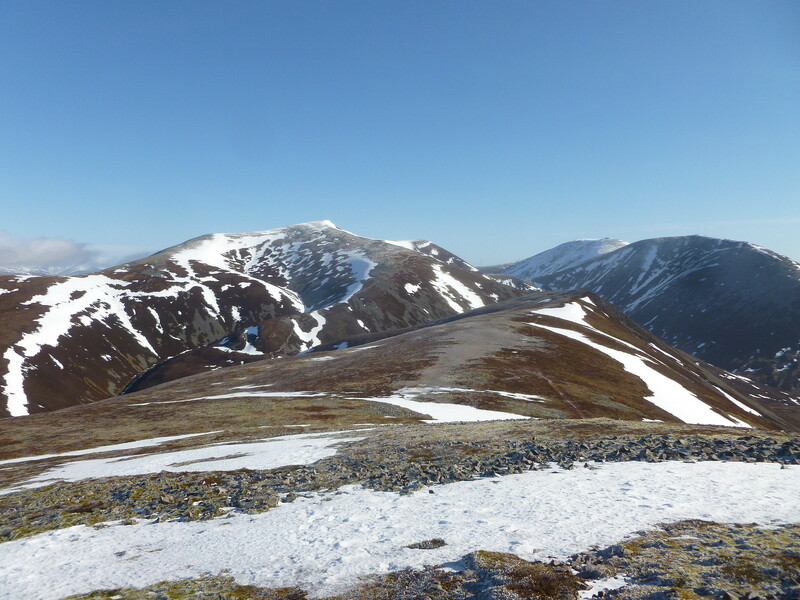 Airgiod Beinn was definitely a case of “paths less travelled” as there was one footprint the entire way that I spotted. It was a nice feeling, being more off the beaten track. And I was happy to extend my day in the hills in any way possible. On reaching the top, the views were as stunning as I’d expected. I started messing around trying to get a photo of me jumping on a rock. It didn’t work very well, largely because the camera kept blowing over. Best of a bad lot. Fun though! A while later I realised that this was because the wind had increased again, and was making standing difficult for me, let alone a camera….Thinking that this was probably a sign to head down, I picked up my things and headed down the ridge, gentle at first with some really cool rocky things, but becoming increasingly steep and giving my knees a real work-out. 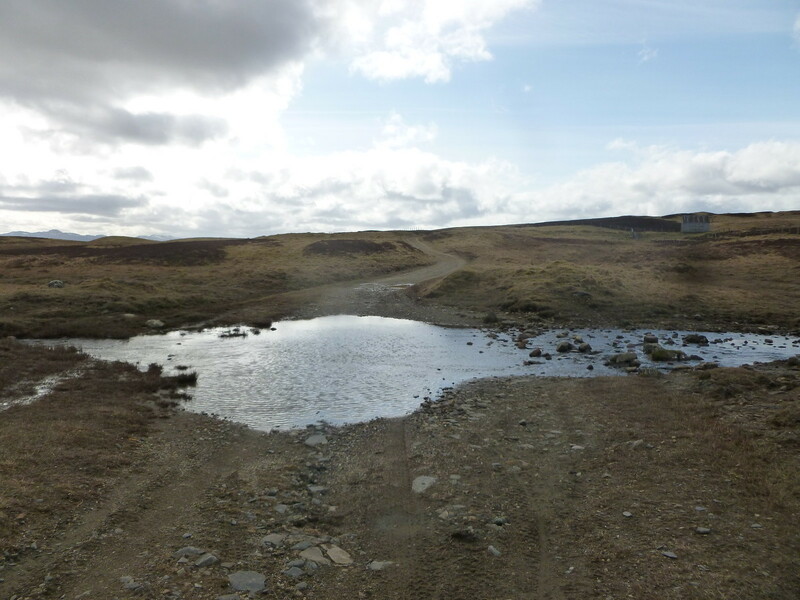 The last bit of descent to the Allt bealach an Fhiodha turned into a stream and bog which wasn’t so fun but made it to the stream with dry feet. I sat by the stream for a while as it was so idyllic, but I had a long way to go so refilled a water bottle and headed off down the path. The reports of the bogginess of this have not been exaggerated, and I can only imagine that it would be a swamp after really wet weather. Parts were stony but there were big sections of mud and bog to negotiate. Still trying to prolong my day, I took my time and stopped for some more photos. 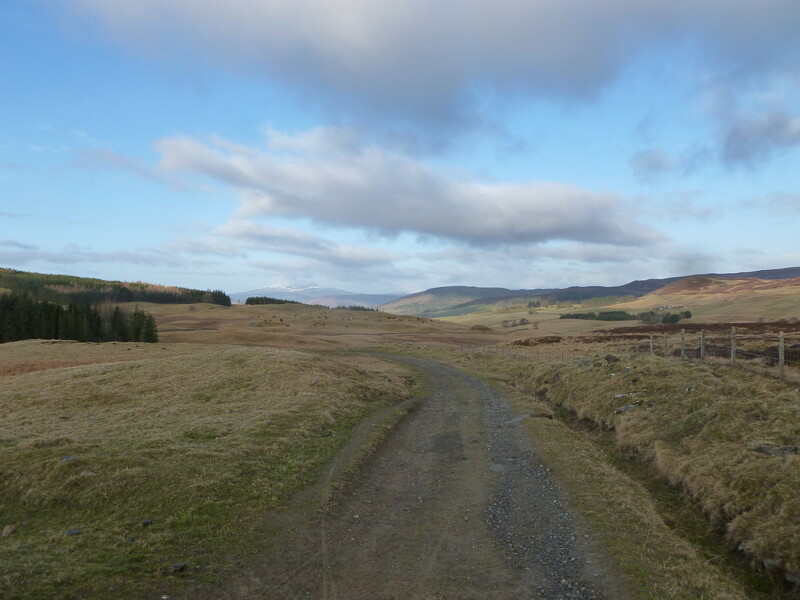 The bog trot didn’t seem as long as I’d imagined fortunately, probably a lot to do with the wonderful views. 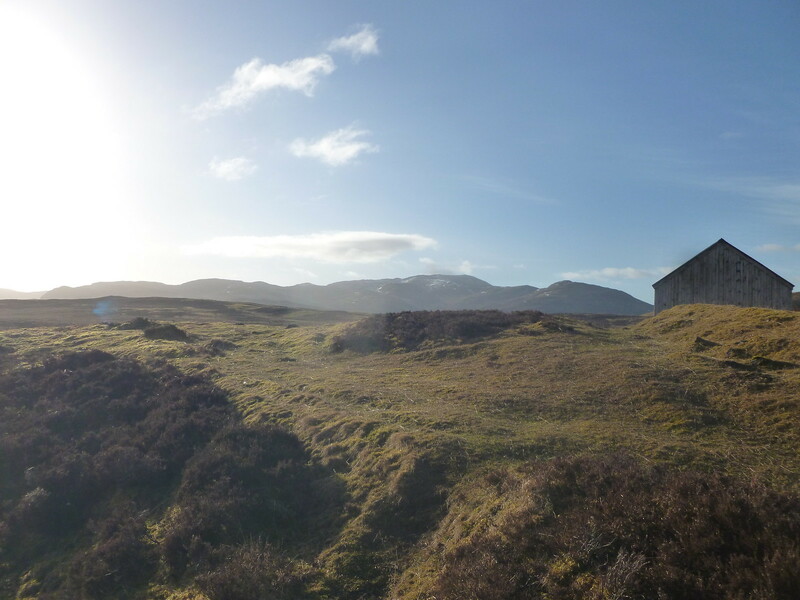 Eventually the boggy path turned into the track that I’d turned off early this morning and after a few more bends, I spied the wooden hut. 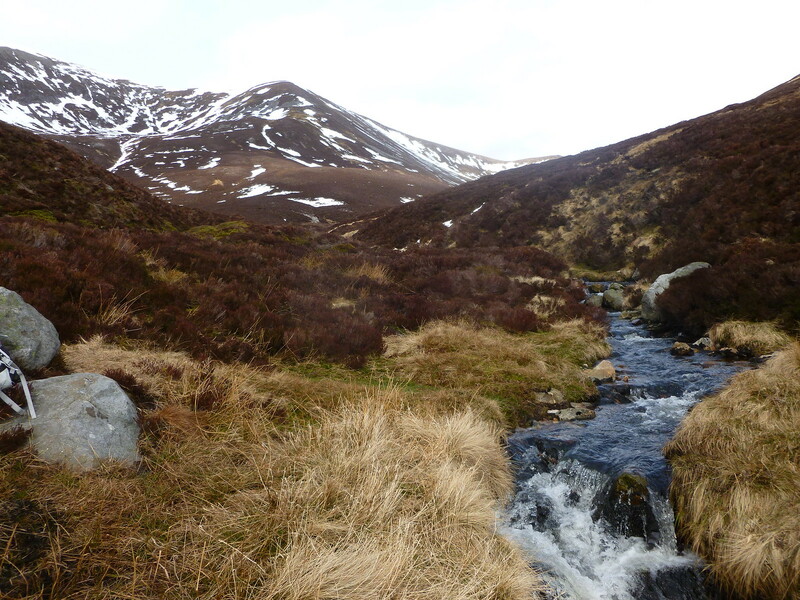 Just before I reached this, there was one final hurdle…a river crossing!!! Fortunately not as bad as it looked and I didn’t need to wade this time! 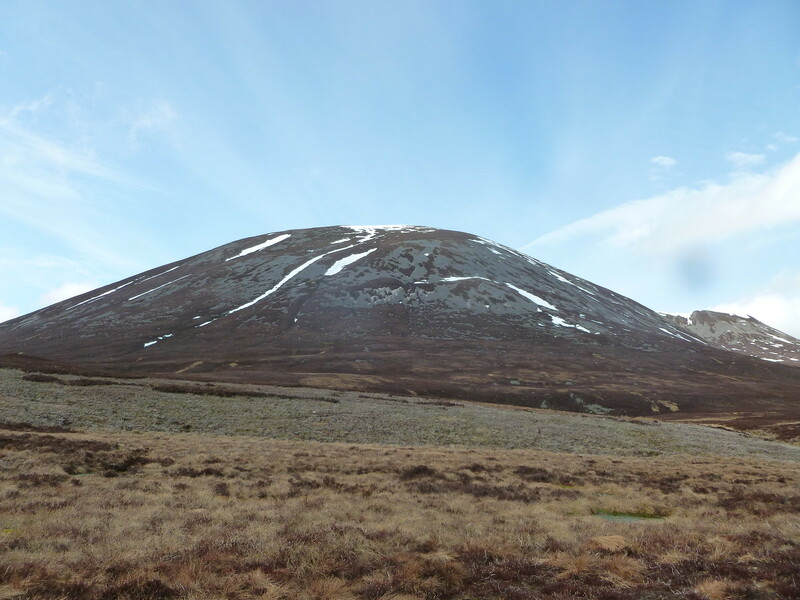 I could see some people coming down the Carn Liath path which I thought was brave. I ploughed on and eventually reached the gate, the road and the car park which was now overflowing with cars. Arriving early is worth it! Boots off felt fantastic. Finishing off my bottle of Irn Bru from the car and putting the 80s party mix back on, I headed back down the road, waved goodbye to the very large cows watching me suspiciously and hit the A9 for the long drive home. Last edited by Jaxter on Wed Nov 30, 2016 3:25 pm, edited 2 times in total. I walk alone most of the time (well always got the dog) and aye it is nice to have company sometimes too. Some fab photos, coupled with enthusiastic narrative. There's something nice about rising around 4am, think it's the sense of adventure and what lies ahead. Another great report. Last time I was up that way the cows were on the approach side to the last gate and crowded around it. Not very pleasant. Love the piccies and WR Jackie or should that read Picaboo! A lot of variety, good views and enjoyment there by the sound of it. Possibly one for us to try in the summer. Well done, that's a decent time for those three at this time of year. I did them on a totally scorching day in July 2014, having forgotten any sort of sun protection which made for pretty amusing (and painful) results. 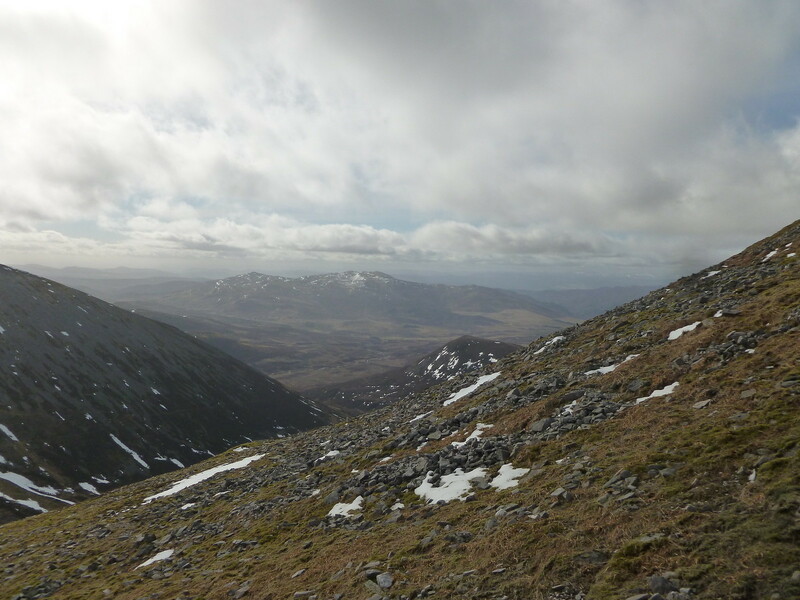 That walk out seems never-ending though, especially my route off (i didn't bother with Airghod Bheinn and just dropped back down to the bealach between Braigh..etc.. and CnG. It was still pretty mushy in places after a week of hot dry weather. The view of the winding ridge from the middle peak is fantastic. A really great walk, well done. There's a lot to be said for going solo, at least once in a while; you become more attuned to your surroundings I think. 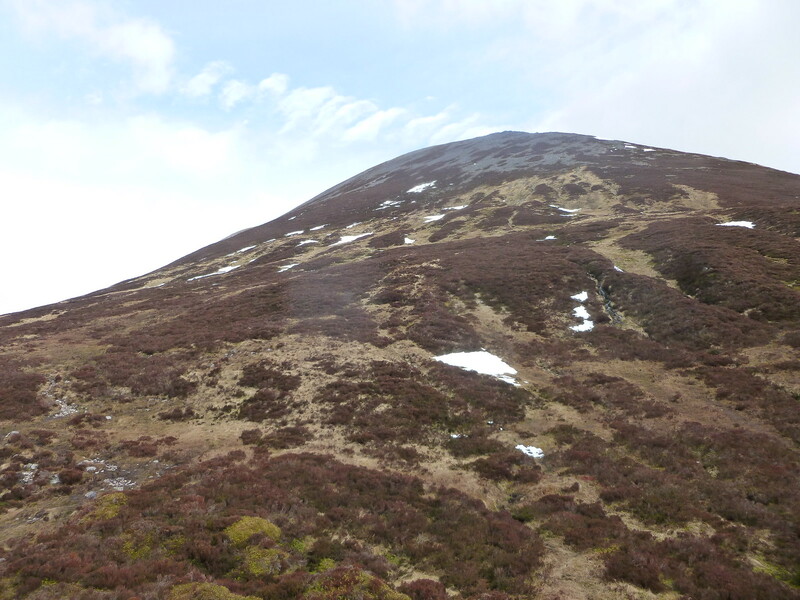 I remember that slope up to Carn nan Gabhar being a sheet of ice when I did this walk back in March 2009 - I was glad to have my crampons! 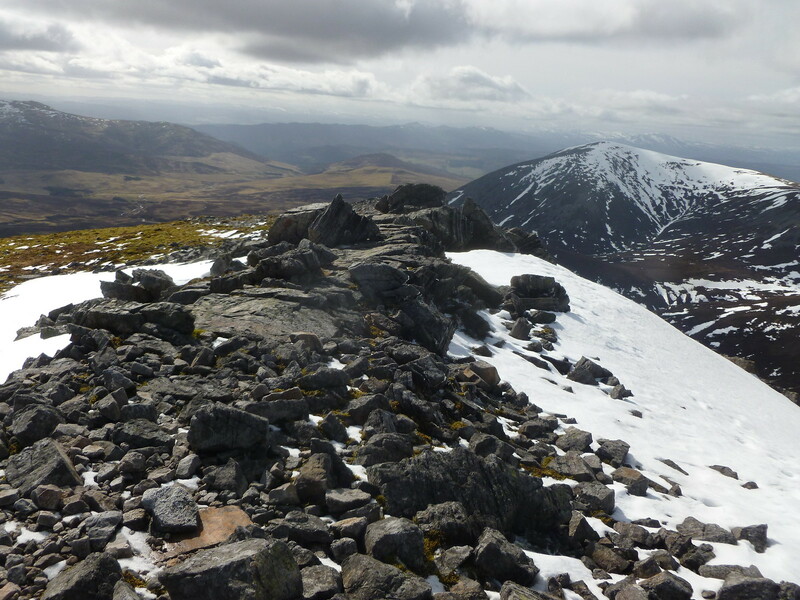 Like you, I came down Airgiod Bheinn, which gave excellent views as well as being a nicely defined ridge - definitely the best way But yes, it's still a long and slightly tortuous walk out. 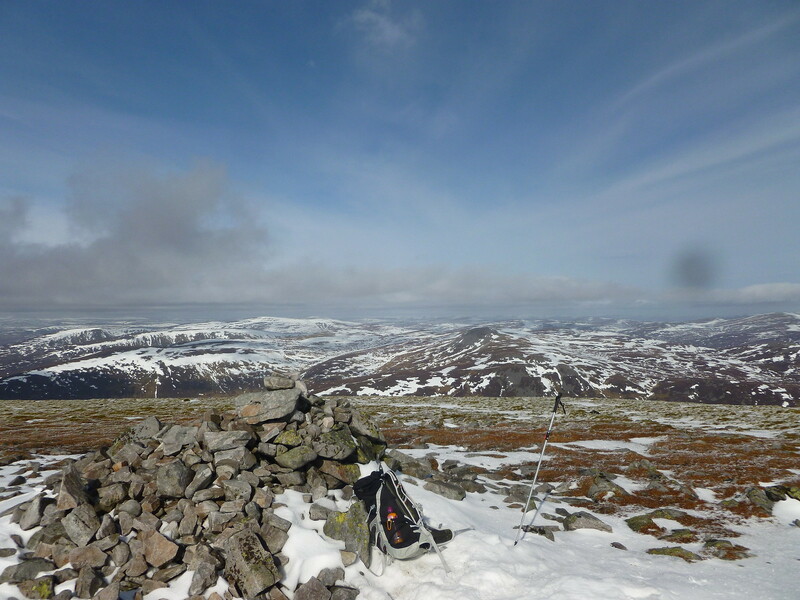 Looks like a very refreshing day on the hills. 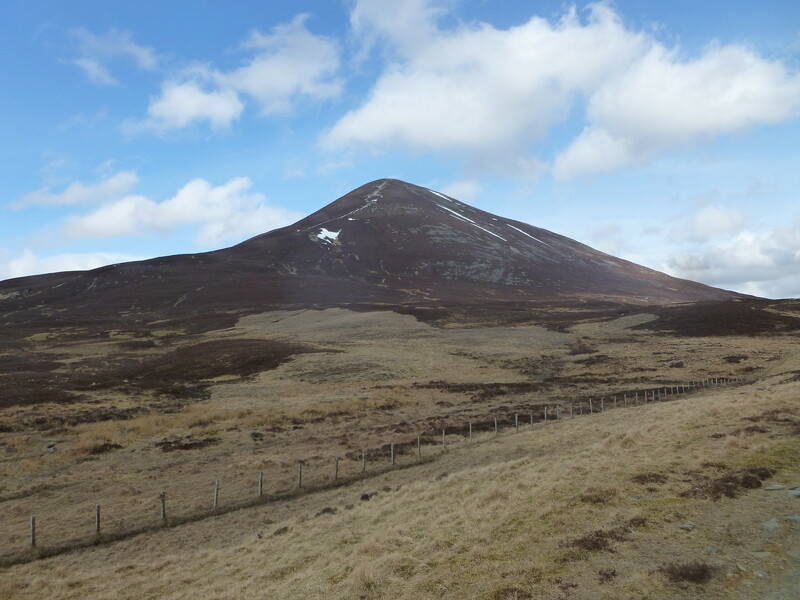 Looks more sociable/ agreeable than the top of Nevis did on Friday. Guinessman wrote: Another great report. Last time I was up that way the cows were on the approach side to the last gate and crowded around it. Not very pleasant. Borderhugh wrote: Love the piccies and WR Jackie or should that read Picaboo! litljortindan wrote: A lot of variety, good views and enjoyment there by the sound of it. Possibly one for us to try in the summer. 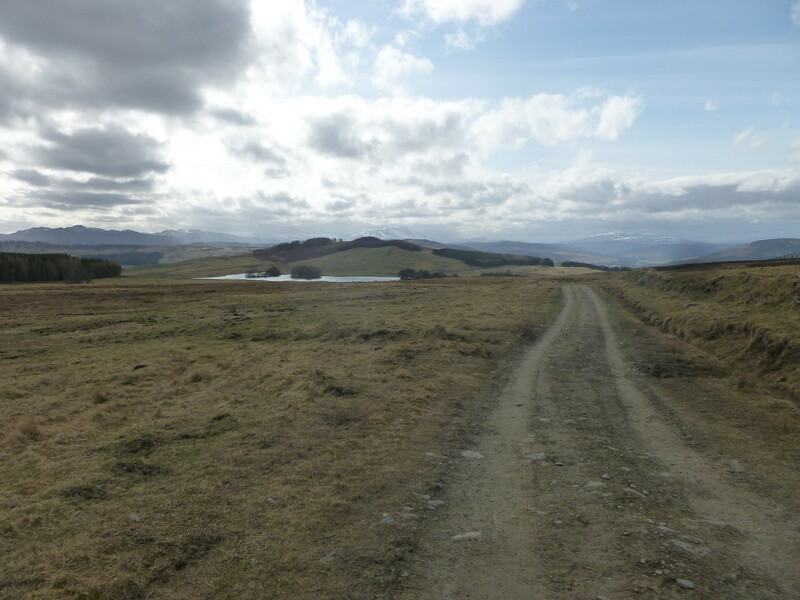 Aye, a really really great walk. Loved every minute Go for it! jupe1407 wrote: Well done, that's a decent time for those three at this time of year. I did them on a totally scorching day in July 2014, having forgotten any sort of sun protection which made for pretty amusing (and painful) results. Thanks! Aye remembering part way round that you've forgotten the suncream....not good... I got away with it this time, only a mildly red nose fortunately! dav2930 wrote: A really great walk, well done. There's a lot to be said for going solo, at least once in a while; you become more attuned to your surroundings I think. Thanks Yeah I was snapping away all day! Andymac75 wrote: Great quality photos. 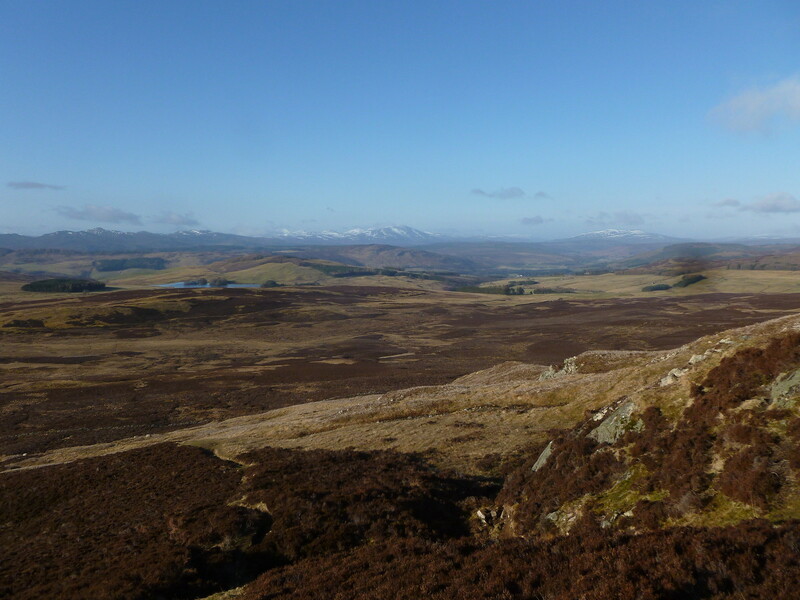 It's a great walk and the views are superb on a clear day. Glad you had good weather to get so many photos and not get drookit feet in the bog trot out. 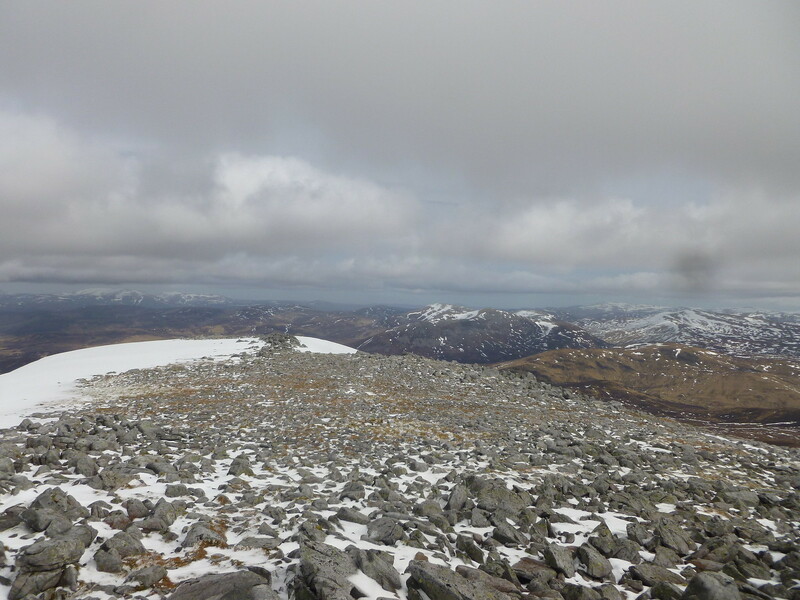 When i did them last summer, I intended coming over the end, but the weather came in and I decided to drop to the bealach, which meant a very long trudge out in pouring rain. My feet still haven't recovered!